I love different sorts of fabric and years ago, when I was at The Vermont Quilt Festival, I fell in love with Daiwabo taupe fabrics. 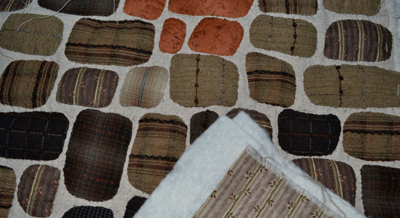 They are Japanese quilting fabrics that are dull in color but very rich in texture and quality of weave. They were too dear for me to buy except for a fat quarter or two, but then I found a selection of them at a discounted price at Sewitsforsale@yahoo.com. It is my favorite on-line shopping site where sewers sell fabrics and other sorts of sewing "stuffs" second-hand. I often find materials here that I otherwise could not afford to purchase. I wrote to one of my friends, bragging about my great Daiwabo find and so when he came all the way from California to visit me, I pulled them out to show to him. He asked if I would make him a wall hanging and selected a pattern out of a Japanese quilting book by Yoko Saito and then picked out a few of these fat quarters. My interpretation of the quilt border is hardly recognizable as the pattern that inspired this piece, but isn't that the way it is when you make a quilt? A few changes in design and different materials and it becomes totally unique. Quilt border in Yoko Saito's Japanese Quilting book that inspired my design. As I loved the many textures of Daiwabo fabrics, I couldn't limit this piece to the few fabrics my friend selected and so, with his permission I added other fabrics. For the background of the mountain, I used Osnaburg fabric. 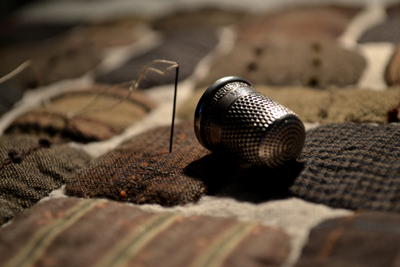 It has a rather primitive weave that complimented the Japanese Daiwabo fabrics. 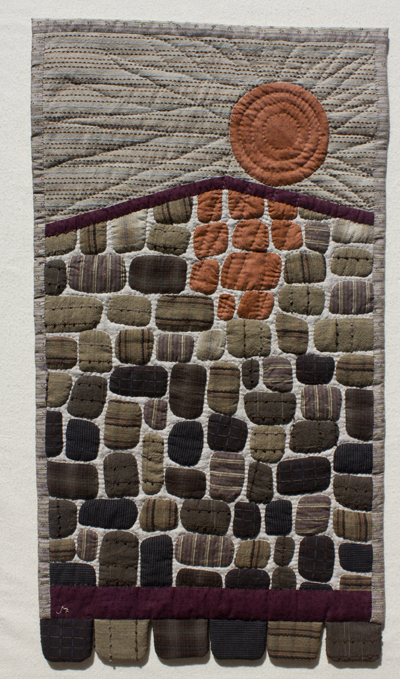 The additional fabrics, I thought added more texture and interest to this piece. It is entirely hand sewn, for that is what I do best. 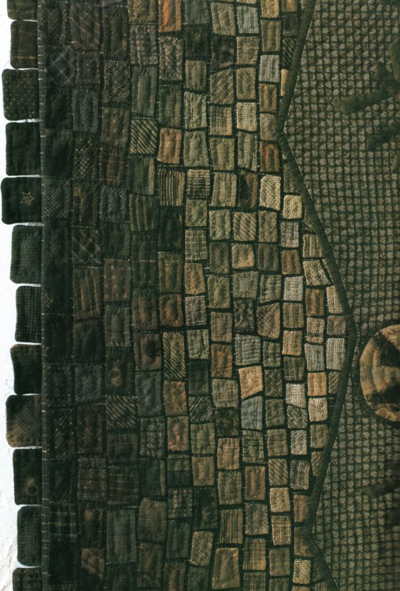 The top woven embroidered striped material and the unbleached muslin colored Osnaburg fabric were pieced together to form the background. I then used Teresa Rawson's glue stick, hand-applique technique using freezer paper (Fabric Therapy, Tutorials) to transfer my design onto the various materials to be appliqued. I was grateful that the irregular sizes and shapes to be appliqued were most forgiving for my first appliqued wall hanging, though I was amazed to learn how easy and exacting this method of applique is to do. Years ago I had laboriously basted under the edges on some appliqued blocks on a sampler quilt and after that stayed clear of appliqued quilt designs, though these were always my mother's favorite sort of quilts to stitch and now I see why. They are a challenge but so very lovely when done! Glue and freezer paper applique technique (Teresa Rawson). I had to make my applique stitches very tiny and pull them tight with the looseness of the Osnaburg fabric and so it gained "puff" before it was quilted. 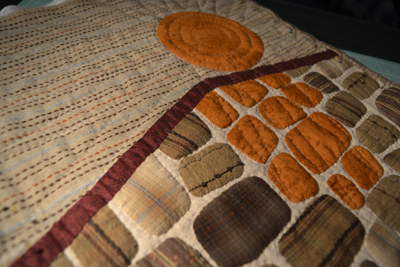 I used two layers of a felted cotton batting to add even more body as well as dimension, making it almost look like I had used a trapunto or pre-stuffing technique, though it is simply appliqued and then hand-quilted around each piece. Pieces to be appliqued pinned for sewing. Paper pieces waiting to be cut. Double layer of felted cotton batting used. Nice puffing effect of applique and quilting. I tried using silk thread when I could match them to the fabrics. I had heard that silk threads make for more invisible applique, but when I had to match other fabric, I found that a quality all purpose thread worked just as well. The looser weave of the Onasburg fabric wasn't the easiest to applique other fabrics to, but its appearance was a perfect compliment with these other woven fabrics. After appliqueing all the pieces, and before quilting it, I carefully hand-washed it, using Woolite to remove the glue. 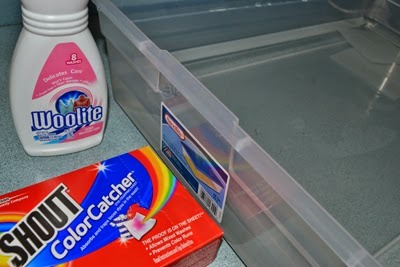 I added color absorbing sheets just in case one of my fabrics ran, though all had been pre-washed so as to shrink and test fabrics for colorfastness. 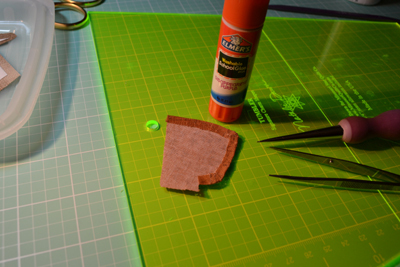 After appliqueing and before quilting, I hand-washed piece to remove glue. I learned much in doing this piece. I learned that some of more textured Daiwabo fabrics have a rayon nub woven into them and would melt with a warm iron, and so I could not iron on my freezer paper pattern to those pieces and had to pin them instead. I also learned that I had to be careful to be sure to turn under a sufficient seam allowance as some of the Daiwabo weaves can unravel more easily than other cotton fabrics. I also had to repair some of the pre-embroided fabrics, if any threads were accidentally pulled. Much like a snag in a sweater, I took a very tiny embroidery hook to pull the threads to the underside. I resolved that I would never use such embroidered fabric again, but at the quilt show I found myself selecting similar fabrics to bring home as their textures are just too beautiful to pass up! I will choose to use them in pieces that won't get heavy wear, however. Pre-embroidered fabric beautiful but challenging! I wrote to my friend that when I make a special-order piece, I continually think of the person I am making it for, and often pray as I work. Like the late Bob Ross, the well-known oil-painting instructor on TV, I am the creator of the quilted piece that I am making and so I work to convert my prayers into my fabric design. My friend had lost his wife of thirty-five years. 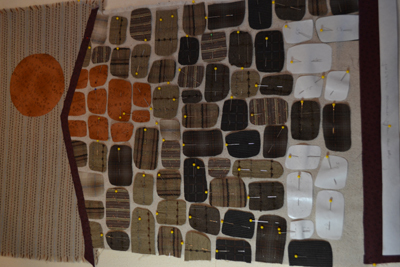 The non-traditional pattern he selected, was transformed into a visual wish for my friend, a mountain with the sun rays warming and brightening it. I do hope he likes it as much as I enjoyed creating it for him. 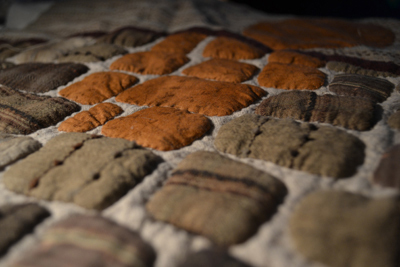 "Pause" from hand-quilting. Are these fabrics beautiful?!! I laughed as I packaged it for shipping using lots of paper so as to avoid having crease folds and then inserted it into a plastic bag just in case it should hit a rain storm on the way, and then used plenty of extra tape to secure the box. My chuckle came from the memory of a group therapy session we held on the psychiatric ward at Denver General Hospital many years ago. Each patient was to bring something of value to share with the group and "dear Eddie" brought a pair of his favorite "lady's skimmers". He had a shoe fetish and his shoe box containing his prized shoes was covered with rubber bands to more than secure it...My package was equally coated with packing tape marking its high value to me! I had grown to love this piece. Though it is only bits of fabric and stitches, it is sewn with much love for my dear friend! I hope that he will enjoy it as much as I enjoyed creating it for him. Labels: hand quilting; wall hanging; Japanese Daiwabo taupe fabrics; hand applique, Teresa Rawson's glue stick hand-applique technique; freezer paper applique.